Ah the finale: the last word a creator has on a particular story before they say goodbye. Some finales are literally the final word on a story, while others leave the door open for future adventures. Doctor Aphra 13 is an example of the latter — Kieron Gillen’s final story with Aphra before passing her on to writer Simon Spurrier. Marvel’s Star Wars comics have to dance between continuity raindrops — making for a series of near-misses that will eventually happen in Empire and Jedi. Gillen takes that same storytelling philosophy and applies it to his own creations that appeared in the pages of Darth Vader. Of course, the first time around it was Obi-Wan’s presence he sensed. I’m almost positive that Walker replicates the staging of the stormtrooper speaking to Vader as he looks off in the distance, exploring the implications of his realization. The closing pages of Doctor Aphra 13 introduce story threads that Gillen lets dangle for future writers — or maybe himself — to pick up down the road. The most rewarding of these is the story of BT-1 and Triple Zero. After spending two separate series in the service of one master or another, Gillen has let his deadly creations to roam free across the galaxy. The affection that he has for these two has always been clear. Personally, I wouldn’t mind a Gillen book focused on the two murder-bots. I read the first volume of Doctor Aphra the other day, and was very impressed. Gillen takes advantage of the anti heroic nature of Aphra incredibly well to create a subversive story that twists seemingly familiar beats through her twisted lens. And her relationship with her father was fantastic – again, the anti heroic nature let’s Gillen twist familiar beats, but to even greater effect. 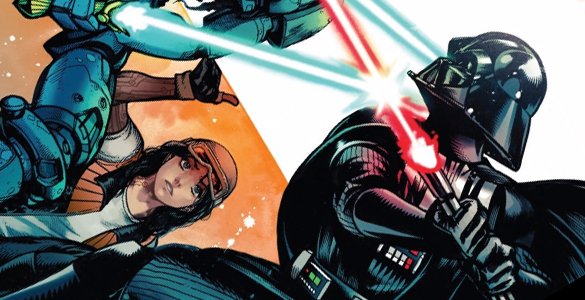 Instead of going for trite cliche, Gillen takes advantage of Aphra’s nature to avoid easy solutions and creates a deeper look at the messed up relationship they have than you could with a more clear cut hero. Gillen did a fantastic job setting this book up as a way to do subversive adventure stories, and act as a counter narrative to the more clear cut morality of the rest of the line. It is a shame Gillen is already leaving, as there is so much more he could do. But I understandable doesn’t want to become just the Star Wars guy, and can understand him wanting to only write one Star Wars book at a time so he has time to write WicDiv and all the rest of his great work. Hope it continues to be great. Hey Drew. Will you and your team review a manga someday?. I would love hear all the thoughts that you guys have. Hi Adam! Unfortunately, I don’t think we’d be a great fit for discussing manga. The most practical reason is the publishing format/schedule of manga. We’re set up rather specifically to turn around pieces on comics within a week of their release, largely because we’re only covering 20-ish page issues. We’re not in a great position to cover longer form storytelling like manga or western OGNs, even though it means we miss a lot of great stuff. The other big reason is that manga draws heavily upon narrative conventions and cultural touchstones that our writers (myself included) are largely unfamiliar with, so our discussions would be rudimentary at best. I think it would be a bit like when a literary critic attempts to review a comic, but ends up focusing on the most banal elements of the medium, simply because the medium itself is novel to them. That’s one of my biggest pet peeves in comics criticism, and I wouldn’t dare be guilty of it myself. We’d have to read a ton of manga in order to clear those hurdles, and we simply don’t have the time or budget to do so. All that said, I deeply respect the comics culture in Japan, and have no doubt that we’d find a ton of stuff that would hold up to the kind of analysis we do here. I’m sure there are great critics doing this kind of thing with manga, but I’m afraid we aren’t the ones to do it. To add onto Drew’s comment, for us to review manga on a regular basis we’d have to review them on a weekly basis when the chapters first come out, as opposed to when they’re collected into trade/tankobon, and in the US we’d have to rely on scantalation sites with morally/legally shaky backgrounds in order to do so, which is something we’d very much like to avoid. Also, Michael, heads-up: Gillen and Spurrier are co-writing the series going forward. Really? That’s cool. Looking at the solicitations, it seemed like Gillen was co writing the next issue to help manage the transition from ‘Gillen’s pet character’ to ‘Star Wars mainstay’, but that Spurrier (who is the sole credited writer for the issue after) was going to then take over. Cool to see that Gillen is still on board. I went to double check, and the Gillen interviews say that they’re co-writing for the foreseeable future, with Spurrier and Gillen plotting arcs together then trading off scripting every other issue, much like how King and Seeley worked on Grayson I believe. Maybe that’s why Spurrier has sole credit on #14. Weird way of crediting the book. Grayson credited both King and Seeley for the story, even if it also gave one specific writer the credit for the script. And the solicits made clear both were writing. Looking up the interviews, it makes sense, but you’d hope that they would make things clearer in the solicits. Surely Gillen’s presence as a permanent cowriter is important information to have in the solicits? Surely that is an important deciding factor for some people on whether they wish to continue reading the book? Dammit that’s my bad. I looked at the solicits and thought Gillen was passing the book off to Spurrier. It sure felt like a finale!